The whittle-and-dub, whistle-and-drum, or pipe-and-tabor were instruments played simultaneously by one musician to accompany morris dancing until the mid-nineteenth century, a practice first revived by Kenworthy Schofield and Russell Wortley in the 1920s. 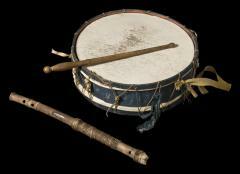 The tabor was strung from the left hand (which was engaged in playing the pipe) and struck with a stick held in the right hand. A snare of horsehair vibrated across its parchment surface. It has been suggested that it was the rhythm more than the melody that the dancers tuned in to in order to ensure they dance in time. This was especially so in the South Midlands, where the noise of the bells attached to the dancers’ shins made it almost impossible for participants to hear the music from the pipe (Chandler 1993:173). The whittles-and-dubs in the Pitt Rivers Museum (1903.129.21 [pipe], 1903.129.22.1 [drum], and 1903.129.22.2 [beater]) were donated by George Augustus Rowell at the turn of the twentieth century. Others in the collection are 1938.34.219 and 1938.34.220 (pipes), 1938.34.548 (tabor stick), and 1962.7.75 (a pipe collected during the folk revival of the 1960s). George Butterworth noted in 1912 that pipe and tabor music was ‘very interesting & picturesque, but requires good playing to be intelligible’. Of the musicians described below, John Potter of Stanton Harcourt was said to ‘almost make it speak,’ whilst at Bucknell Joseph Powell was said to know few of the correct tunes, often drifting into the ‘Maid of the Mill’ (Butterworth MSS f.17, quoted in Chandler 1993:174). The following information on local musicians is largely taken from Thomas Carter’s letters to Percy Manning, and from Keith Chandler’s research. Carter was engaged by Manning to search Oxfordshire for a whittle-and-dub for his collection (see section on Manning and Carter below), and became deeply involved in this research. These letters are preserved in Manning’s notebooks, at the Bodleian Library in Oxford, and on microfilm at the Centre for Oxfordshire Studies. Through his work Carter met a wide range of people who had either played the whittle-and-dub or had known the old morris musicians, and he often traces a single instrument from household to household, linking the instruments to their owners and their lives. ‘Jim the Laddie’ was famed in Gloucestershire and west Oxfordshire for his whittle-and-dub playing, accompanying the Sherborne and Northleach morris sets and possibly also Great Rissington (all in Gloucestershire). Jim the Laddie, aka James Simpson (1811-1856), had in fact been baptised James McDonald in Edinburgh, and acquired his nickname when he migrated southwards to Sherborne as a child. 'Mrs Groves Called on me the other day and tells me the Dub ie Tabour Cannot be found at Present. It was seen among some Rubbish some 4 years Back but if it is found we shall be sure to get it. Thomas Carter was evidently an enthusiastic worker, following countless trails around Oxfordshire in his pursuit of a historical whittle-and-dub for Percy Manning’s collection. Many of the leads he followed were based on local reminiscences of relatives playing the instruments in certain locations, or on rumours about instruments long since lost. In Carter’s letters to Manning, therefore, not only do we find a report of his progress in following up these clues, but also a potted biography of each musician and their musical lives: where they lived and played, which villages could boast a morris team, and where the musician eventually died. This is the case for John Potter. John Potter (1813-1892), referred to as Bob or Ted Potter in some sources, was well known as a musician around Oxfordshire. He played fiddle, pipe and tabor, and possibly other instruments for a number of morris sides and for social dancing and events. A carrier and later a carpenter, Potter 'always suffered with the cold', possibly developing rheumatism or arthritis – although this did not prevent him playing the fiddle right up until his death, from old age, in 1892 (Oxford Times 19 March 1892:5, quoted by Chandler: http://www.mustrad.org.uk/articles/potter.htm). 'Joseph Woods is now an old verry Deff and feeble old man. He Playd for the Morris from 16 years of age. A native of Deddington Bfor Leaving at 10 and has Played to all the villages for 25 miles Round. 'Mr Joseph Powell of Bucknell Learned to Play the Pipe and Tabor from old Tom Hall of Islip and another man most likely Old Woods of Deddington as he was a tall old Man – (so was Woods). Powell and his men visited all the Villages Round – and only Once did He Play at Oxford. Here he got a lot of money. His Men Danced in Top Hats. He tells me He learned to Play over 40 years ago. George Augustus Rowell (1804-1892) was employed by both the Ashmolean Museum and the Oxford University Museum (now of Natural History). His interests were diverse and he published numerous papers on meteorological subjects as well as letters detailing disputes with his employers over the new Ashmolean collection catalogue he had compiled. In addition he published a single article on folklore and its collection, detailing a little of his own investigations into the subject. Rowell was one of the first authors to describe in detail Morris dancing and its associated customs as actually performed, instead of indulging in literary and fanciful speculations about its supposed origins and significance. In 1886 he published an article entitled 'Notes on some old-fashioned English customs: the mummers; the Morris-dancers; Whitsun-Ales; Lamb-Ales'. This contained a detailed account of the Lamb Ale festival of Kirtlington, at which a 'Lord and Lady' were elected among the villagers and a drinking bowery set up so that drinking, feasting, dancing and merry-making would continue for all of Trinity Week. Kirtlington Morris dancers as well as sides from other villages attended, dancing in competition. The Lamb Ale festivities of this kind ceased after 1859, though there is some evidence that Morris dancing continued sporadically for a few more years. The items collected by Rowell had thus probably lain unused for 20 years, those acquired from Carter for 30. It seems probable that Rowell acquired his whittle-and-dub in the course of this research into Kirtlington mumming and morris customs. His instruments are certainly crudely fashioned home-made ones. Of the musicians known to have played at Kirtlington, one had his pipe and tabor buried with him; another gave his instrument to a Bucknell musician, who still had it in 1912; so this may well have belonged to the third, one Nelson of Stoke Lyne, who was often so drunk that he had to be tied to a tree to keep him upright while he played (information from personal communication with Mike Heaney). Rowell held the same views on the degeneration of ancient practices that we find in Henry Balfour’s work at the Pitt Rivers Collection. Rowell believed that mummers plays were ‘probably connected with customs handed down to us from very early times and stage performances’ although today’s performers ‘were merely disguised with but little or no regard to the characters, and the words spoken with very little knowledge of their meanings’ (1886:97-8). He makes a similar comment with regard to the music that accompanied morris dancing, noting that, ‘The music was the simple tabor and pipe, and these, probable, merely to mark the time: the use of the fiddle in late years seemed quite an inappropriate innovation’ (1886:103). In his article Rowell goes on to describe the Whitsun ales of the seventeenth century, hoping to connect these to the lamb ales still held in the late nineteenth century. Like Manning, therefore, Rowell was interested in local history in addition to its material culture. Both men succeeded in collecting examples of whittles-and-dubs, Rowell’s coming to the Pitt Rivers, whilst Manning’s are thought to have been at Cecil Sharp House during the Second World War where they were destroyed during the Blitz. It is even possible that the two men were well acquainted with each other: Manning was at least aware of Rowell’s work, and his notebooks include a copy of Rowell’s 1886 article in Manning’s handwriting. In 1880 General Pitt Rivers brought his collection to Oxford, and four years later the Pitt Rivers Collection opened as an annex to the University Museum. Balfour (1863-1939), as the first curator of the Pitt Rivers Collection, was keen not only to find out more about the objects in the Museum’s possession, but also to augment the collections. In total Balfour donated over 12,700 objects to the Museum, although around a quarter of his total donations were collected by fieldworkers on his behalf. Balfour worked with a range of local people in order to augment the collection (especially Thomas Carter, see below) and like Rowell, bequeathed his own whittles to the Museum (1938.34.219 and 1938.34.220), probably acquired with the help of independent collectors. It is probably that Rowell and Balfour knew each other well, since they worked together at the University Museum (now the Natural History Museum, of which the Pitt Rivers Collection was then a part), and it is even likely that it was through this acquaintance that one learnt from the other about the whittle-and-dub and the necessity to find out about its history and to salvage an example for the Museum. Balfour clearly had some connection with Leafield, for in 1896 he obtained from there two pipes used by the musician for morris dances, and a tabor stick (1938.34.219, 220 and 548). The instruments obtained from Balfour for the Museum are much superior to the pipe obtained from Rowell a decade before, and were it not for the absence of a maker's name might be thought to have been made professionally. Percy Manning, via Carter, had also collected a pipe, tabor and stick from Leafield in September 1894 (see below). Like Balfour, Percy Manning (1870-1917) employed collectors to work on his behalf. This was perhaps as a consequence of his high social status or his speech impediment (aphasia) – although this did not prevent him giving occasional public talks. His most prolific employee was Thomas Carter (b.1832), a retired bricklayer and vigorous geological collector to whom Oxford’s University Museum of Natural History owes a fair proportion of its collection. Carter’s local knowledge was extensive, and his social background closer than Manning's to the villagers from whom they collected, thus he made the perfect surrogate collector – as well as supplying information and specimens to Balfour, and no doubt others. His letters to Manning, from which many of the extracts here have been taken, provide a fascinating insight into his (and by proxy, Manning's) methods. Despite his status as hired help, he clearly became deeply involved in Manning’s work and the search for the whittle-and-dub in particular. In Manning’s notebooks the start of his interest in the whittle-and-dub is marked with the simple observation that for morris dancing, ‘The music was always supplied by the pipe and tabour, or, as it was more generally called, the “whittle-and-dub”.’ He adds with a tone of considerable regret, ‘I know of no one now living who can play these instruments, and it is to be feared that the traditional style is lost’ (Manning d.200:49, later published 1897:319). Over subsequent pages his interest develops into a concern to salvage the physical instrument by finding one for his collection, thus saving the instrument from sharing the fate of its music. 'I started at once and found out the Parties who had the same years ago – but I was much Disappointed in not getting it then – but after walking Hard from Place to Place I found out that the Tabor ie Dub Had been lent to be Repaired years ago to a man in the town and of Course I found Him out[. H]e could not find it but was Confident it was in his House somewhere and when he found it I should have it. Carter's trail is a frustrating one, often resulting in disappointment, as when an informant ‘told me that she gave her children the whittle and Dub to play with and she remembers them breaking them to pieces.’ Likewise Carter records that, ‘Mr Groves Called on me the other day and tells me the Dub ie Tabour cannot be found at Present. It was seen among some Rubbish some four years Back’ and thus there is little hope of finding it again (Manning d.200:79). The Marston whittle-and-dub from the extract quoted above went a similar way, ‘Distroyed years ago.’ Carter adds, ‘I felt very sorry as you may imagine, after days of labour to draw a Blank’ (Manning d.200:74). Carter’s weariness is clearly evident in his reports, his bitterness at the ongoing situation barely concealed as he requests funds from Manning that he might continue his search, ‘for they won’t let me travel by Rail Free…. Hoping to hear from you soon as I want money to go on with’ (Manning d.200:70-2). Despite such frustrations Carter remains hopeful, always including in his letters a silver lining such as, ‘if it is found we shall be sure to get it’ (Manning d.200:79) or ‘she gave me a word of hope telling me to find out some of her Husband’s people at Heyford as it was just possible to get one from there’ (Manning d.200:74). Yet his weariness is never far from the surface, and he frequently uses the word ‘hope’ with reference to his search, on one occasion explicitly stating sulkily, ‘I do hope I shall get it – I really think [I] deserve one after all my tramping’ (Manning d.200:76, emphasis in the original). Carter's letters thus give us unexpected insight into the life of a local collector and one of the first fieldworkers, at the turn of the twentieth century. Of the instruments obtained by Carter on Manning’s behalf, one whittle, dub and tabor stick came from Leafield, where Balfour also had contacts (see above). They were supplied by Jonathan Williams, and had belonged to his grandfather. Williams' father, a potter by trade, also played for the morris, and these may have been his instruments. Alternatively they may have belonged to a blind Morris musician named John Dix, who died in 1855. In either case, they had survived the intervening years well. The pipe and tabor were integral to morris dancing until the mid-nineteenth century, when a shortage of musicians led them to be replaced by the fiddle, and later the concertina and melodeon. A correspondent in the local press for 1858 lamented that whilst the dancing had been ‘very credibly performed’ at Bampton that year he regretted the ‘substitution of a squeaking fiddle for the appropriate, and… orthodox “tabor and pipe”,’ and similarly in 1863 it was noted that morris dancers ‘made their appearance, but… they still obstinately persist in employing a squeaking ‘fiddle,’ instead of the more legitimate tabor and pipe’ (my emphasis, Jackson’s Oxford Journal, 29.5.1858:8 and 30.5.1863:8). One difficulty inherent in the substitution of fiddle for whittle-and-dub was the lack of a rhythm element. Many players adapted their technique, so that the melody was often interspersed with ‘grunts’ and ‘squeaks’ where the musician added percussive emphasis to aid the dancers. Another solution was to employ a separate side-drum or tambourine player to keep time for the dancers (Chandler 1993:179). A further result of the transition from whittle-and-dub to fiddle and concertina was that the increased range of these instruments (only a good player could manage a complete two octaves on the pipe) allowed new tunes to be introduced and played. The extent of this shift was so profound that when Sharp began collecting morris tunes after his encounter with William Kimber in Headington in 1899, he found that, ‘of the tunes which we have noted down from fiddlers, &c., only very few are capable of being played on the more ancient instrument’ (Sharp and McIlwaine 1974  I:35). __________ 1879. The assistant keepership and the new catalogue of the Ashmolean museum [correspondence between G.A. Rowell and J.H. Parker]. Oxford. Manning, P. 1993 (c. 1890-1910). Folklore Collections by Correspondents of Percy Manning. MS Top.Oxon d. 192. 415 exp. __________ 1993 (c. 1890-1910). Collections on Morris Dancing and Whitsuntide Celebrations in Oxfordshire. MS Top.Oxon d. 200. 290 exp. __________ 1993 (c. 1890-1910). Collections on the celebration of seasonal feasts in Oxford University, City and County: and on mumming. MS Top.Oxon d. 199. 393 exp. __________ 1993 (c. 1890-1910). Collections relating to Oxfordshire village life in the 19th century. MS Top.Oxon d. 193. 158 exp. Maher, John, From Bristol Folk News, Autumn 1972, No 10 "Cuckoo's Nest"